Normality of the residual(error) distribution. I would like to explore the assumption of residual distribution. You can look at your residuals (loss) as an indicator of good fit. If your residuals do not follow a normal distribution, this is typically a warning sign that your R2 score is dubious. There are a few statistical tests for Residual Normality, particularly, the Jaque-Bara test is common and available in scipy. Jarque-Bera performors a hypothsis tests, where the null stats that your residual sample is from normal distribution. The test p-value reflects the probability of accepting the null hypothesis. If it’s too low then you reject it. As you can see from the test above, that the p-value for the normal distributions is much larger than 5% which the p value for the arbitrary poisson distrubtion is much lower than the 5% baseline. 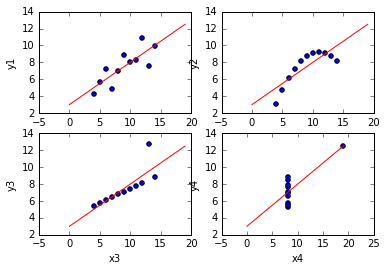 Although we can’t run the Jarque-Bera test on Anscombe’s quartet above (because there aren’t enough samples), we can see from the example above it should be a good metric to evaluate our model beyond summary statistics, which the Anscombe exmaple proves can be misleading.